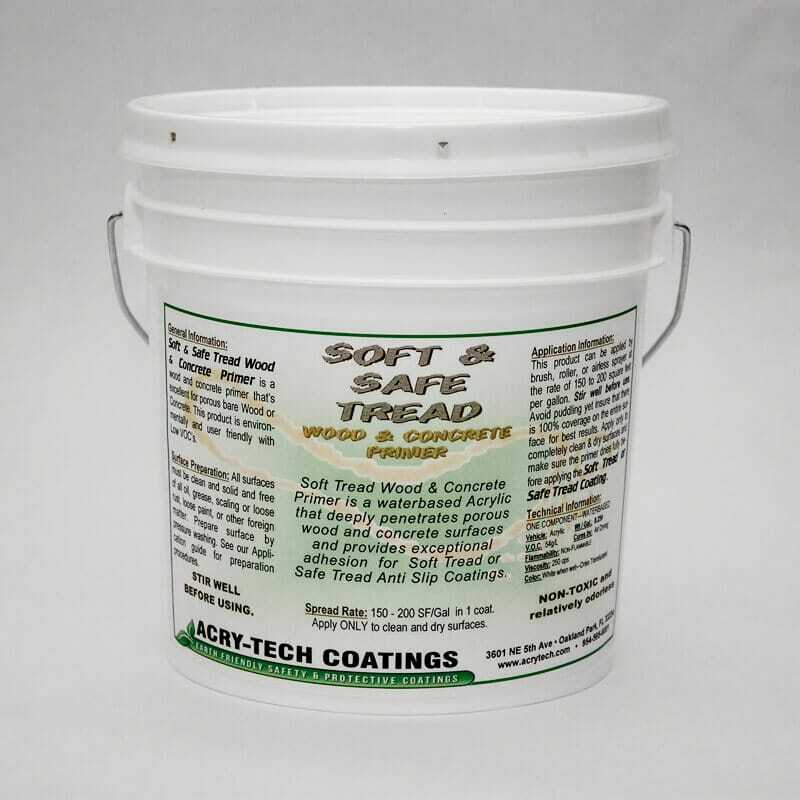 Soft Tread Wood & Concrete Primer is a single component, waterbased Acrylic, deep penetrating primer to seal porous wood and porous concrete surfaces and provide exceptional adhesion for Soft Tread or Safe Tread. This product is environmentally friendly and user friendly with Low VOC’s. Cleanup is fast and easy using only soap and water. Prepare concrete surfaces by acid etching and pressure washing. Prepare wood surfaces by pressure washing to remove all old stain, paint, dead wood fiber or other contaminants. Prepared surfaces must be completely dry prior to the application of the Wood & Concrete Primer. 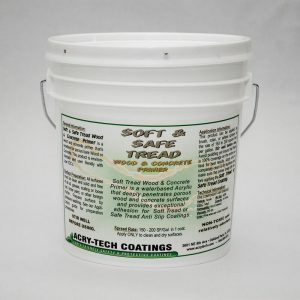 This product can be applied by brush, roller, or airless sprayer at the rate of 200 square feet per gallon. Stir well before use. Avoid puddling yet insure that there is 100% coverage on the entire surface for best results. 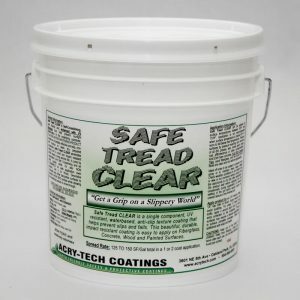 Apply only to completely clean & dry surfaces and make sure the primer dries fully before applying the Soft Tread or Safe Tread Non-Skid Coating. Do not apply if rain or evening dew is imminent within 4 hours of application as film formation of the Primer may be compromised. CAUTIONS: Keep out of the reach of children! Keep from freezing. Close container after each use. Do not take internally. Avoid eye contact. Wood & Concrete Primer is a single component, waterbased Acrylic, penetrating primer to seal porous wood and porous concrete surfaces and provide exceptional adhesion for Soft or Safe Tread. 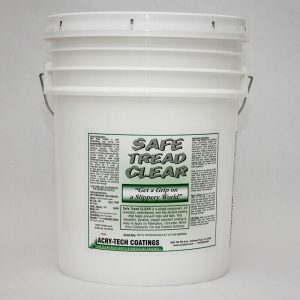 Apply at 150 to 200 square feet per gallon to seal porous surfaces and provide exceptional adhesion and “hold out” so that the Soft Tread or Safe Tread creates a uniform and continuous film on these surfaces without flash drying. This product is environmentally friendly and user friendly with Low VOC’s. Cleanup is fast and easy using only soap and water. Wood & Concrete Primer is an off white color when it’s wet, but dries to a translucent clear when it is completely dry so you know when it’s safe to apply the Soft Tread or Safe Tread. This product can be applied by brush, roller, or airless sprayer at the rate of 150 to 200 square feet per gallon. Stir well before use. Avoid puddling yet insure that there is 100% coverage on the entire surface for best results. Allow “Thirsty” substrates to absorb as much primer as they want in order to completely seal the substrate for best performance. 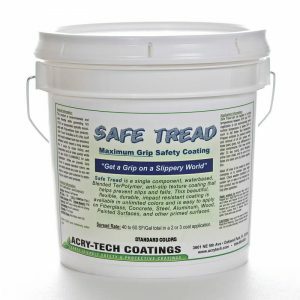 Apply only to completely clean & dry surfaces and make sure the primer dries fully before applying the Soft Tread or Safe Tread Non-Skid Coating. Do not apply if rain or evening dew is imminent within 4 hours of application as film formation of the Primer may be compromised. Spread Rate: 150 to 200 SF/Gal total in a 1 coat application. Color: White when wet, translucent clear when dry. Keep out of the reach of children! Keep from freezing. Close container after each use. Do not take internally. Avoid eye contact.